From Summer Blahs to Fall Hurrahs! The days have already begun to get shorter. Some of the evenings have gotten cooler. Fall will soon be in the air. I’m already thinking of the transformation of bright colored leaves in the trees above. We don’t have to wait for the trees to change to bring the color change of these plants into the garden. We can bring these colors into our containers and into our beds by using the plant Codiaeum variegatum , commonly called “Croton”. Crotons are native to southern Asia and the western Pacific islands. They will not survive our winter, but they are ideally suited to being used in our gardens as a seasonal item. Last September I placed crotons into my garden. Their bright, colorful leaves caused such a stir that people would slow down driving past my house to see what was creating such dramatic impact. There are quite a few varieties of crotons and the leaves range in size from an inch to over a foot long. The leaves have a waxy coating that give the plant a shiny glow. Many of these varieties work great in tropical landscapes, but there are only a few that are what I consider perfect for decorating with in the fall. The most popular variety is ‘Petra’. Petra’s leaves are oval shaped and six to eight inches long. The leaves are variegated (multiple colors). New leaves emerge yellow and green and as they mature they can turn blush, red, burgundy, orange, salmon or pink or a combination of these colors. In the fall they are available in pots from four inches across to twenty two inches across. The six inch pot size seems to be the most suitable for planting into the garden and for use in containers. The plants are about twelve to fifteen inches tall. One croton placed in the center of a container surrounded by chrysanthemums will add fall drama to your container. Another croton that has fall merit and deserves a place in your garden is ‘Mrs. Robinson’. Don’t hide this in a hiding place where no one ever goes. Mrs. Robinson has large leaves that look like giant colorful oak leaves. Colors range from greens to yellows to pinks and reds. I used several of the large ones as a keystone in my fall decorating last year. These four foot tall plants emerged from behind my yellow and pink mums. They looked spectacular. Croton ‘Mamey’ has large six to eight inch leaves that have a twist to them. The colors range from bright yellows and reds to even tones of burgundy. The unique twist adds a different texture to the garden. 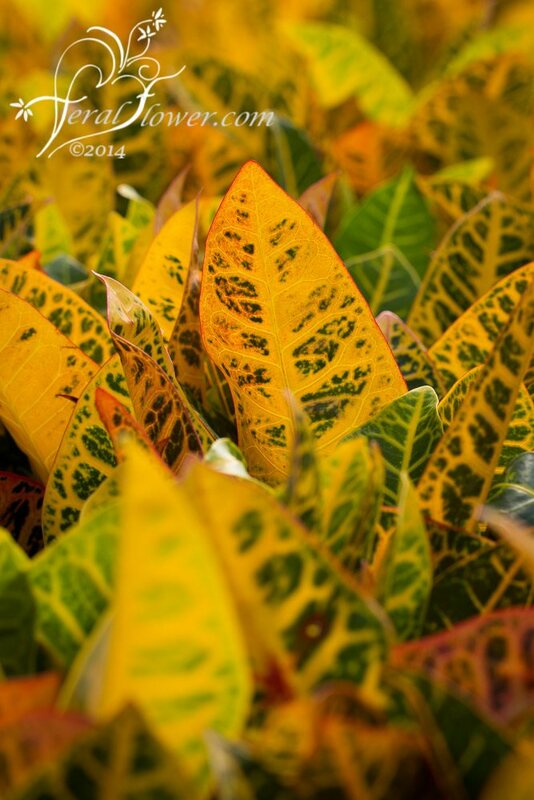 One of the interesting things about a croton is that the colors can vary from plant to plant. Very similar to how the colors on the fall trees vary. Croton ‘Picassos Paintbrush’ has long slender almost whispy leaves that range from green to yellow with tinges of red. The fine leaves almost add a wheat like texture to your container. Since we are treating the fall crotons as an annual, the amount of sun they get is not very important. They will last until the first hard freeze. You can decide to bring them in at this time and treat them as a houseplant. They are sensitive to over watering and should be watered only when the top of the soil is dry to the touch. When first brought inside they may drop leaves as they get adjusted to the indoor conditions. This is normal, but they should start to produce new leaves soon. Once indoors place them in a brightly light location.